Peanut butter and jelly sandwich is an iconic American dish. 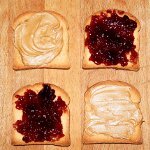 Celebrate National Peanut Butter and Jelly Day on April 2 in honor of the best breakfast and lunch sandwich ever. Combination of sweet jelly and salty peanut butter is a good idea. Besides jelly won't let peanut butter stick to the roof of your mouth. So if you suffer from arachibutyrophobia (the fear that peanut better sticks to the roof of your mouth), you should adore this combination. The story says, that the first peanut butter and jelly sandwiches were developed by American soldiers during World War II. They decided to combine the usual products of their ratio into something new and developed a fabulous treat. When the soldiers came back after the war, the sales of peanut butter and jelly soared. Did you know that the biggest in the world peanut butter and jelly sandwich was made in Peanut, Pennsylvania in 1993. The sandwich was 40 ft long and contained 50 lbs of jelly and 150 lbs of peanut butter. Celebrate National Peanut Butter and Jelly Day with as many sandwiches as you want. Today you have a perfect excuse to indulge in this sweet treat!